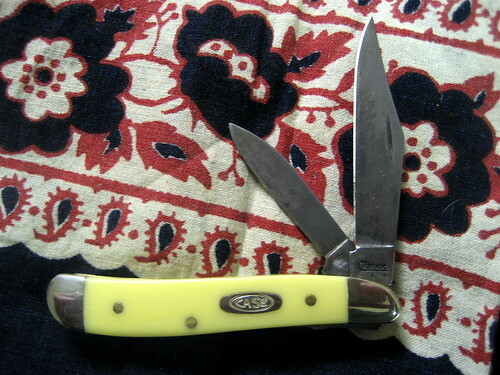 Discussion in 'Traditional Folders and Fixed Blades' started by black mamba, Jan 20, 2010. 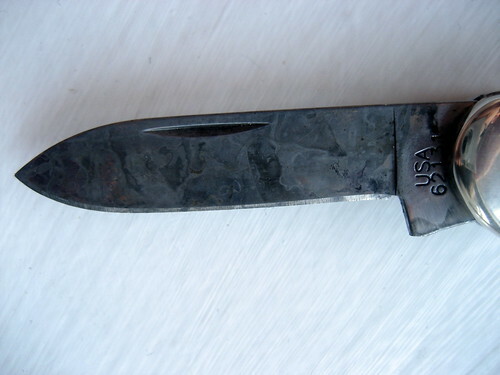 I have several older knives with nice "earned" patinas, but never had the guts to force one myself. Finally I did. Just got this nice Texas Jack in CV, and spent the last 4 hours alternating between a gala apple and a naval orange to stick the blades in. Left them in each time between 40 minutes and an hour, pulled out to let dry for about 10 minutes in between, then wiped off and stuck her in again. I think it turned out pretty well. A couple of swipes on the edge of the Texas Jack and it'll look sweet. Of course you're right, Ozy. I was so anxious to take the pictures I forgot to "re-edge." All is right, now. Thanks! Forced patinas...fits in along with new leather jackets that have been "antiqued", new jeans with holes in them, slouch boots, baseball caps aged with a belt sander and new "pocket worn" jigged bone. the splotchiness will dimish after you use it for a while, the aged effect will even out. 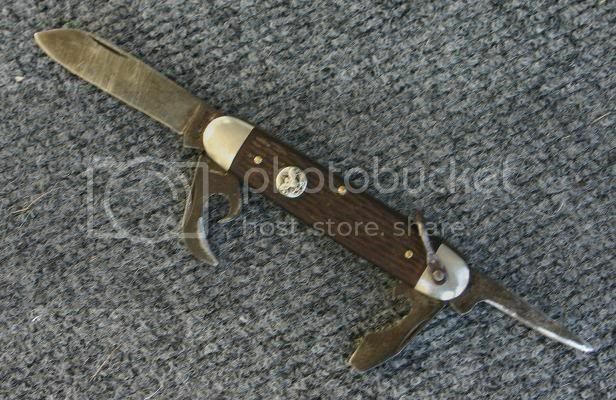 We must be following each other around, black mamba - I just ordered and received a new Texas Jack Amber Bone CV, too! It looks like a darn sweet knife from what I can tell - haven't carried or used it enough to get to know her yet. I think that modified pen blade looks GREAT. 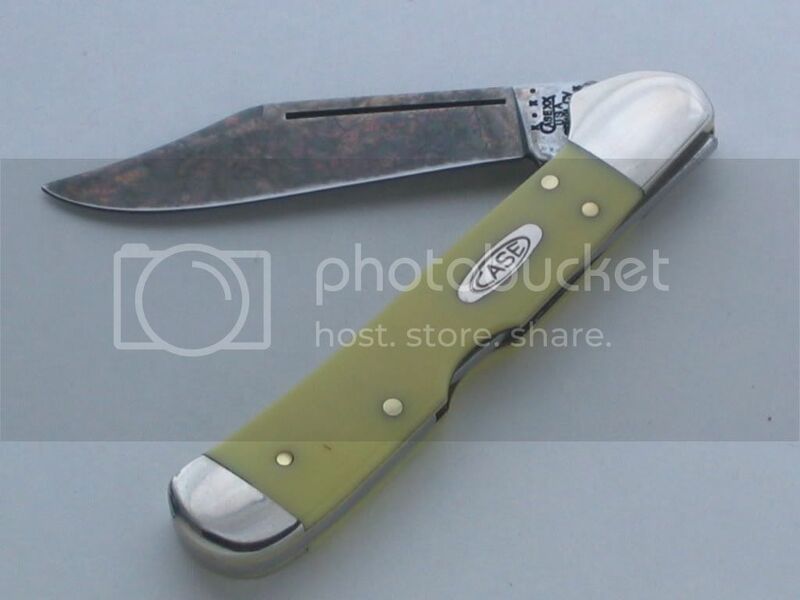 :thumbup: Looks kinda like a compromise between a pen blade and a wharncliffe. As to forced or earned patina: do whatever turns your crank - it's YOUR knife! This my first and only forced patina as well. I also used the apple trick. The dark spot is where it bisected a seed. FirstIm a little like Absinthur in this, but one advantage with a forced patina is that it prevents brown rust. Whiping of the blade also prevents brown rust. At least my CV patinas tend to get gray but not very dark gray. It has some kind of natural balance. If I dont use them time darkens them a little. And as I nag about here, The patina is a living surface so a dark appleforced spotty patina will even out as the knife get used and cared for. After say a mounth of dayly use you cant see if it has lightened up after the forced patina or darkened from natural use. I've forced one myself not long ago. It had a tiny spot of rust when I got it, so I cleaned it up and put a patina on it. The OP's forced patina looks great to my eye. I forced two patinas this month. On my canoe, I stuck the blades in a potato for an hour and then impaled some kumquats on the blade for an hour or so. The kumquats did a lot more than the potato did. Eventually, I got a really interesting patina on the blades. On my peanut, I immersed the blades up to the tang in Dr Pepper. After an hour, they looked perfect, albeit more even than the canoe experiment. 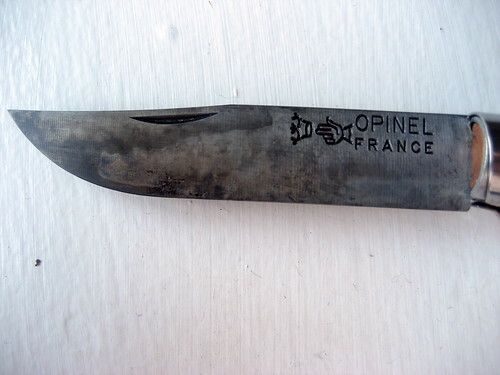 I have an earned patina on my opinel. I will update this post later with some photos. Ken44, this picture in another thread is what got me to "take the plunge!" I love the mottled colors along with a uniformly darker state than mine has. Maybe in time mine will darken and even out. Black Mamba, has the patina changed any on yours in the last few months? If you carry the knife much I am curious to see if it has evened out any. I decided to try to force a patina on a Case Sod Buster Jr in CV. 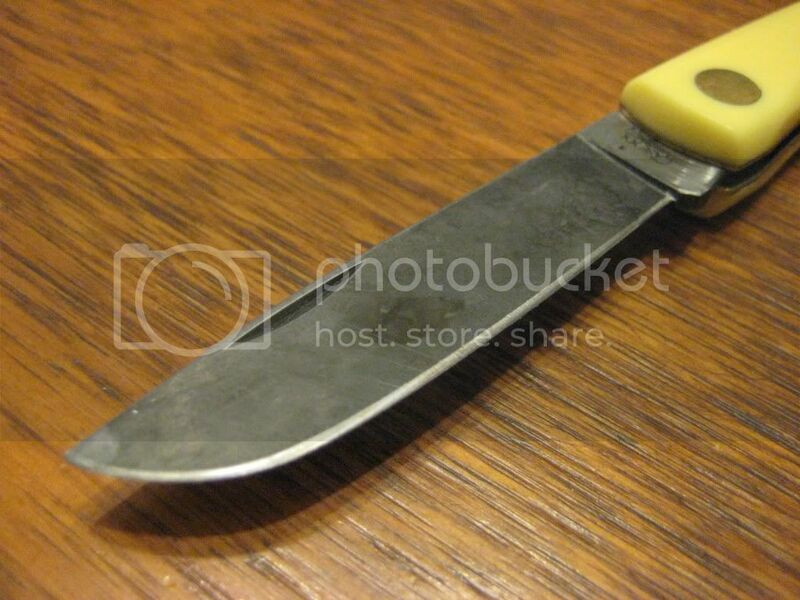 First, I spread some Guldens Brown covering the blade, and then used a q-tip to thin it out here and there. I let it sit like that for about 5 hours and when I looked at it it looked like it was rusted out. It was just the dried mustard, but it was really dark. I rinsed it off, and then washed it with a stiff nylon brush followed with a well used green Scotch-brite pad. The mustard was pretty stubborn where it was thinnest and that is where it left the darkest stains. Next I soaked a paper towel in balsamic vinegar and wrapped that around the blade to put an even color everywhere but the darkest mustard stains. I let that sit for about 3 hours and it did it's job. I finished by using a little Flitz to smooth the surface out, and take the edge off the staining. Then I sharpened and stropped. I think it came out OK, but I might reverse the process next time, or find something other than mustard to accent the vinegar stain. I had a carbon steel kitchen knife a while back and decided I'd let the patina build naturally. I got the ugliest most uneven, unsightly darn marks I'd ever seen. If I ever find the thing I'll take a picture and you'll see what I mean. I see forcing the patina as just giving the 'canvas' a color wash before painting the masterpiece. "How did you force your patina?".... "I stuck it in an apple" .....says he. What difference is there in that? FLymon, funny you should dig this one up today. Just got back from church and taking my wife to the airport, and this little jack is my Sunday go-to-meetin' knife. It was in my right front as I read your post. Here is a pic hot off the digital. Hasn't changed much, I'm afraid-- I mostly only carry it on Sundays, and it gets little use. My next "patina project" is going to be a short soak in some liquid to give a slight background color, then use mustard to paint on a hamon line. Might look kinda' neat on a slippie, maybe my #9 Opinel. Would this be forced or earned? I cut up limes to make Margaritas. By the end of the night alot of limes were cut and I forgot to clean up until the next morning. 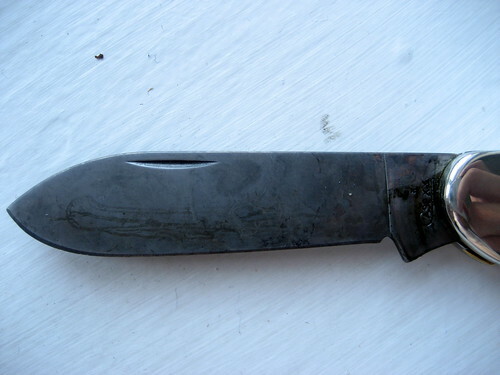 My Case SBJ cv blade had a pretty darn even and dark patina on it. My aching head said earned patina. I've forced a patina on that knife a few more times the very same way. I'd say that one was EARNED! If you want to try a more even patina, more of a French gray look, try this. Clean the blade with a degreaser. Warm up some vinegar, get it warm enough that you can barely leave your finger in it. Place it in a glass or ceramic dish deep enough to cover the blade. Put the knife in the solution and leave it alone, it wll fizz ever so slightly and the bubbles stick to the blade and give it a coating. The longer it soaks the deeper the etch. I leave them in for about 10 or 15 minutes, then take them out, wash with soapy water and check the color. If its too light you can repeat the process. Too dark and you can lightly steel wool it (wet the wool with light oil) until you knock down the color. When you like the color, give it a light coat of oil and call it a day. I've made some old school style knives and got a nice even color this way. My funnest forced patina was with ketchup, mayo, and BBQ sauce.